Vaccines are a must for children as they protect them against dangerous infectious diseases. Following the immunization schedule helps your child stay healthy. It also helps the community, because of what’s called “herd immunity”. Of course, some people do not respond adequately to vaccination but the number of non-responders is usually small and varies depending on the vaccine. Also, certain vaccines are contraindicated in some children because of medical conditions or medications that weaken the immune system. Herd immunity is a protection imparted on the entire community, including those with inadequate immunity, due to the immunized people preventing the infection from entering the community in the first place. It works only if a very high percentage (often as high 95 percent, depending on the disease) receives the appropriate vaccines. Therefore, by refusing vaccines for a child with no contraindication, you are putting other children and adults at risk. Here we present information on immunizations that your child should receive during the first 18 months of life. Each is administered in several doses on particular schedules. If you start late or miss a dose, however, there are “catch-up” schedules available. DTaP vaccination – This is to prevent diphtheria, tetanus, and pertussis, all of which can kill. The schedule consists of four doses, given at 2 months, 4 months, 6 months, and then 15-18 months of age. Hib – This vaccine protects against Haemophilus influenzae Type B (Hib), one of the three most common causes of bacterial meningitis in young children and adolescents. The schedule for Hib immunization consists of 3 doses administered at 2,4, and 12-15 months, or 4 doses administered at 2, 4, 6, and 12-15 months, depending on the particular type of Hib vaccine. Polio – Polio is a devastating disease and a major global health problem. Like many other viral conditions, it can present with general symptoms of infection such as fever, fatigue, nausea, and headache. However, the poliovirus harms the body’s motor system in particular. This can lead to death, in some cases, because of paralysis of the breathing muscles. Survivors can be left with permanent weakness or paralysis. A famous example is US President Franklin Roosevelt. During FDR’s lifetime, no vaccine was available for polio and, while the public was unaware of the extent of the president’s disability, everybody knew of somebody who suffered from the disease. In large cities, parents were so frightened of oncoming polio epidemics that they would keep their children away from public swimming pools, even on the hottest summer day. Then, when researchers asked for volunteers for testing the first polio vaccine in the 1950s, parents eagerly brought their children to serve as subjects. Parents did this because they had grown up seeing and experiencing a world without a polio vaccine. Today, however, polio immunization is one of the prime targets where anti-vaccine activists direct their misinformation campaigns. It’s quite ironic, but the anti-vax movement survives, only because vaccines have been such a great success. Unlike parents of the 1950s, parents in Western nations today don’t know anybody affected by polio, so some of them reason that the risk of not being vaccinated must be quite small. But polio has not yet been eradicated. It’s still a problem in certain parts of the world, and it can bounce back even in the West if large numbers of people reject polio vaccination. The recommended vaccine today is the inactivated poliovirus (IPV). Keep in mind that this is one of the most important vaccines to give your children. The first dose is given at 2 months, the second at 4 months, and the third any time from six to eighteen months of age. Hepatitis B – A lot of times parents neglect, or postpone, the initial dose of this vaccination because of controversy surrounding whether the immune system can be primed very soon after birth. Hepatitis B causes liver damage, can lead to liver cancer, and often liver transplantation is the only cure. The virus is transmitted through blood and other body fluids, and it is actually more infectious than human immunodeficiency virus (HIV). For this reason, the US Centers for Disease Control and Prevention (CDC) suggests giving all newborns an initial dose of monovalent HepB vaccine within 24 hours of birth. Additionally, for newborns whose mothers test positive for the virus, the CDC recommends administering both the vaccine and hepatitis B immune globulin (HBIG) within 12 hours of birth. In contrast with the vaccine which primes the infant’s own immune system, HBIG provides what is called passive immunity. The idea is that it will keep the virus in check, while the child’s immune system learns to protect against it. Pneumococcal disease –This is a bacterial infection that can lead to pneumonia, which can be fatal. To prevent it, the recommended vaccine is the Pneumococcal conjugate5 (PCV13), which is given as a 4–dose series at 2, 4, 6, and 12-15 months of age. Measles-mumps-rubella (MMR)– This combination vaccine also is a target for anti-vax misinformation campaigns, which have provoked some recent measles outbreaks. As with polio vaccination, parents look around and don’t see anybody with measles, rubella, or mumps. They may know somebody who had measles a generation or more ago, plus old television programs often show kids home with the measles, so they figure that it’s not a serious disease. But measles can have respiratory complications, and even can lead to death. Most people with mumps recover completely, but the disease can lead to serious complications, such as encephalitis (inflammation of the brain). Generally, rubella is a more mild disease but, if a pregnant woman is infected, the result can be birth defects. The schedule for MMR differs from the others listed here in that the schedule starts later. The first dose is given at 12-15 months. Booster doses are given throughout childhood and later life. Rotavirus –There are two versions of the vaccine. One is called Rotarix and is administered as a 2–dose series given at 2 and 4 months of age. The other, RotaTeq, is given in 3 doses, at 2, 4, and 6 months. Influenza – Flu vaccination is typically rejected more than any other vaccine, but a child with flu is at risk of several serious complications, plus even a mild case of flu in your child can keep you home from work for days or weeks. The main challenge to flu immunization is that there are many influenza viruses circulating around the globe. These viruses evolve rapidly, so every year a new vaccine is developed that attempts to match the strains of flu virus –usually four strains at once– that are expected to the most problematic for that season. Each year, vaccine developers are chasing a moving target, and so often the effectiveness of the vaccine is far below 100 percent. It is very common to know of a least one person who caught the flu, despite having received the flu vaccine. You should keep in mind though that more cases of flu are prevented by vaccination than occur in spite of vaccination. The vaccines generally improve each year, so overall it is better to get vaccinated than not to get vaccinated. Furthermore, the typical influenza can be a lot worse in children (and also elderly people) compared with adults in their prime. Other vaccines – the 12-18 month age period is also a time when your child can receive the initial dose of vaccines for other conditions, such as varicella (chickenpox) and hepatitis A. As with MMR, there are subsequent doses that the children receive at a later time. 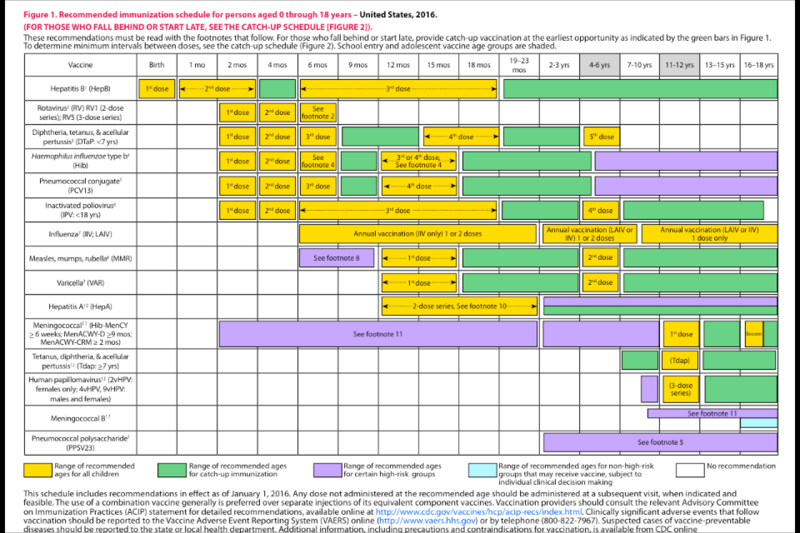 To help guide you, we have included the CDC scheduling chart for the various pediatric vaccines.